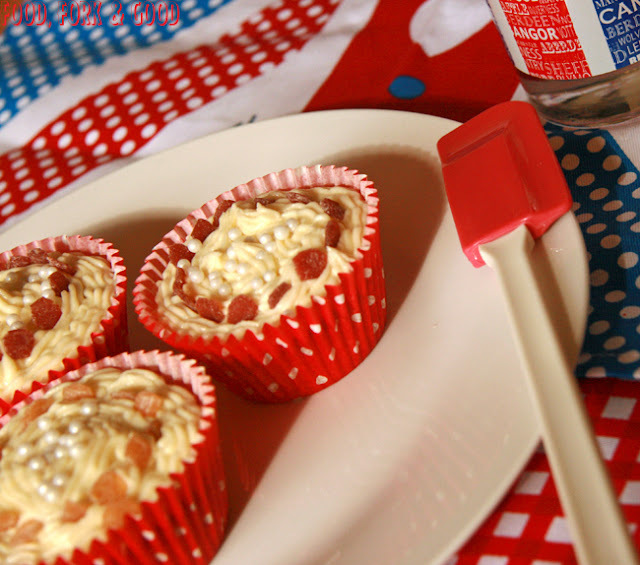 Jubilee Baking - Fork and Good. Afternoon all. Today I'm recovering from my four day weekend of celebrations, shopping, Village fairs, baking and general awesomeness. I'm coming down off a four day sugar high and the hangover does not feel good... but it does feel worth it. There was a lot of tasting to be done, and a lot of cakes to make. The best thing about 4 days off from work is that it feels like mini holiday, and pretty much everyone was getting into the spirit of it all. Around my way there were street parties (That carried on despite the rain), a Jubilee fayre in my Nan's Village, a 4 day music festival in the park, so many Union Jack decorations your head would spin and even a parade through our town. Cream the caster sugar & Butter together until pale & creamy. Mix the cocoa powder, water, coffee Granules & caramel syrup in with the egg. Add into the sugar/butter mixture and whisk for a couple of minutes. Sift the flour in bit by bit and fold until everything is combined. The mixture should be a pale creamy brown colour. Spoon into 12 cupcake cases and bake in the oven for 15-20 minutes until a skewer placed in the middle of the largest cake comes out clean. Leave to cool. In a bowl, mix the melted butter and icing sugar together with a splash of milk and the vanilla essence. Spoon over each individual cupcake. Push a mini chocolate finger into each cake and finally dust Cocoa powder lightly over the cakes. Leave the icing to set before serving. Cream the caster sugar & Butter together until pale & creamy. 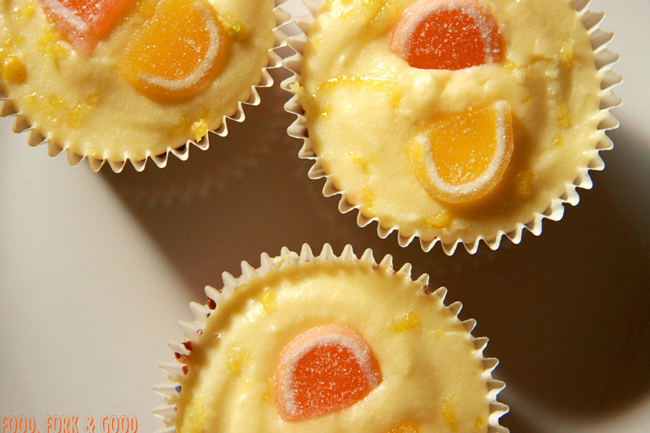 Mix the Valencia Orange extract & food colouring in with the egg. Add into the sugar/butter mixture and whisk for a couple of minutes. Sift the flour in bit by bit and fold until everything is combined. The mixture should be a pale orange colour. Spoon into 12 cupcake cases and bake in the oven for 15-20 minutes until a skewer placed in the middle of the largest cake comes out clean. Leave to cool. In a bowl, mix the softened butter and icing sugar together with a splash of coconut milk, the juice from half a lemon and the vanilla essence. 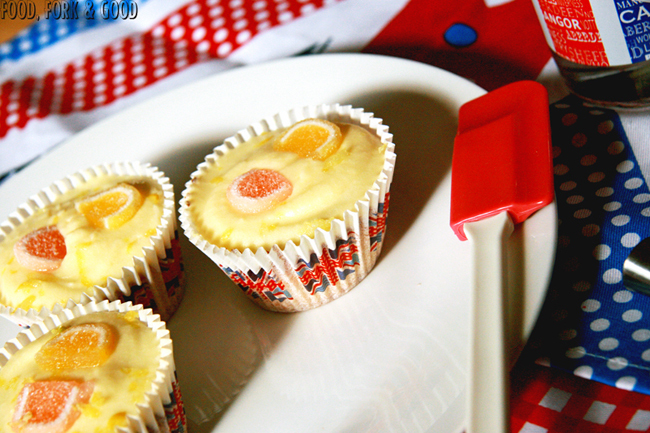 Spoon over each individual cupcake, it will be slightly stiffer, so swirl around using a spoon or palette knife. 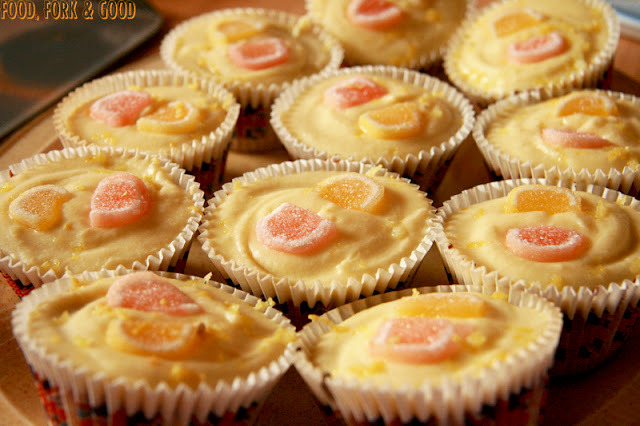 Decorate with the Orange & lemon slices and grate some lemon rind over the top of the cakes. Leave the icing to set before serving. Cream the caster sugar & Butter together until pale & creamy. Mix the strawberry jam, boiling water & Pimms together until everything is combined. Beat in with the egg. Add egg/jam mixture into the sugar/butter mixture and whisk for a couple of minutes. Sift the flour in bit by bit and fold until everything is combined. The mixture might be slightly lumpy, but it doesn't matter. Sift in the further 10g of flour and combine again. 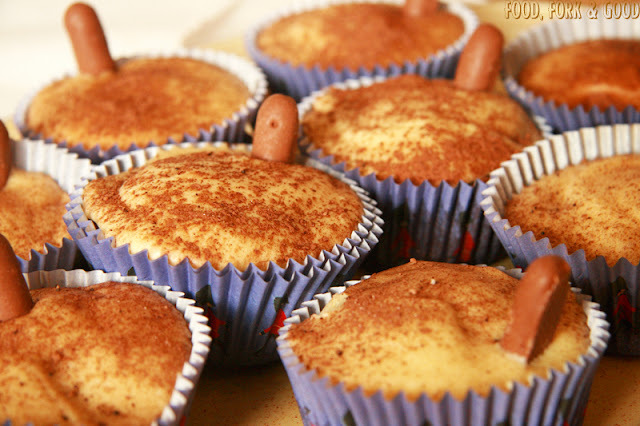 Spoon into 12 cupcake cases and bake in the oven for 15-20 minutes until a skewer placed in the middle of the largest cake comes out clean. Leave to cool. In a bowl, mix the softened butter and icing sugar together until very stiff, add the vanilla essence and add more icing sugar until the mixture can be piped & shaped. 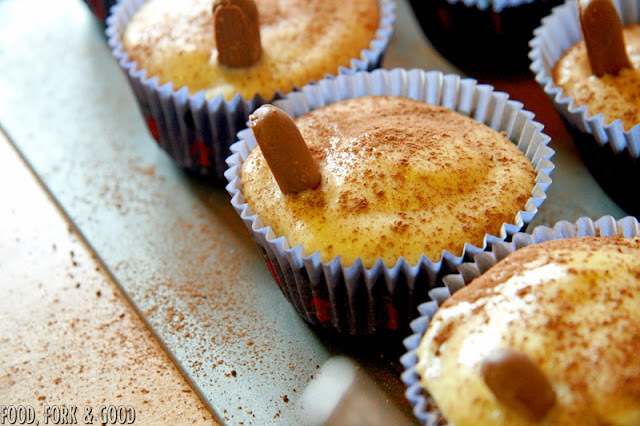 Add to a piping bag and squeeze over each cupcake or simply spread with a spatula if you don't have a piping bag. Decorate with the fruit flakes & sugar pearls. Leave the icing to set before serving. Hope you had a fantastic weekend, no matter where you were! You can totally be in my gang! Wow, so many cupcakes, and all of them look so yummy! Wow, what a feast! We've been watching the festivities here in Canada -- it must be so exciting to be in the middle of all the action. I'd love one of those Toffee Coffee Cocoa Cupcakes. Thank you =] Kris has a great eye for angles on food! You could open up your own bakery/cafe here in Canada with your talent. awesome! such great cupcake flavors. I wouldn't know which one to try first. They are so pretty! I love esp. those coffee cocoa flavour. Yummy! Sounds like a pretty fun and delicious weekend! 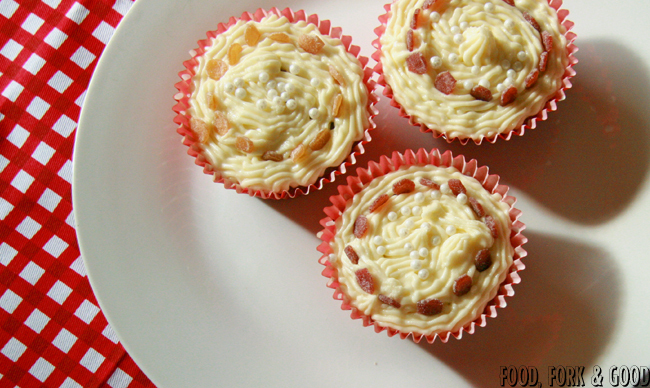 Your cupcakes are all so pretty and sound delicious, I especially love the toffee coffee ones!! Yummy cupcakes! Very nice blog! You blog is amazing and I have found some wonderful recipes which gave flavor to my life.